Bumps, scrapes, or breaks? No problem! Sniffles, fevers, and rashes? We can help! Check-ups, physicals, or advice? We got you covered! Just 4 Kids Urgent Care is a state-of-the-art, child-friendly health care facility. Our providers are pediatric specialists who use specific treatment modalities to treat kids with common illness or injury. your child will spend less time waiting and more time getting better. Our urgent care practice specializes in treating infants, children and adolescents in any urgent situation – from earaches, fevers, infections and abdominal pain to dehydration, asthma, fractures, lacerations and more! Involvement: We provide the highest quality of support to you and your child, making care-based decisions together. Technology: Our urgent care clinic is up to date with technology and computer systems, including our online check-ins that give you estimated wait times. When your pediatrician or family doctor is unavailable, we’re the best alternative to the emergency room! There is nothing more important than the health and well-being of your children. We know that illness and injury cannot wait, and that’s why our office is here when it matters most. Just 4 Kids is a pediatric urgent care facility in Idaho Falls, and it is our goal to provide child friendly, state- of-the-art healthcare for a wide variety of needs. Having a sick or injured child is hard, it can be scary, but it’s even worse when it happens after hours. For parents, there is always a question of where to go, and what the best course of action will be. There are few options for care when your pediatrician’s office is closed, and you want to avoid a costly or unnecessary trip to the ER. We work alongside your child’s regular primary care doctors to keep your little ones happy, healthy, and back on the road to doing what kids do best - being a kid. Sport & Scout Physicals - Is your son or daughter joining a sports team or going to summer camp? We can do the required physical exams so they can get out there and have some fun! Lab Testing - We do a variety of in-house labs and utilize local lab facilities for the tests we can’t do. We have the majority of results in as little as 15 minutes, which helps determine our treatment plan. Concussion Testing - Concussions are a scary thing, which is exactly why we became a credentialed IMPACT Concussion Testing Center. We can help sort out how bad it is and what to do next. 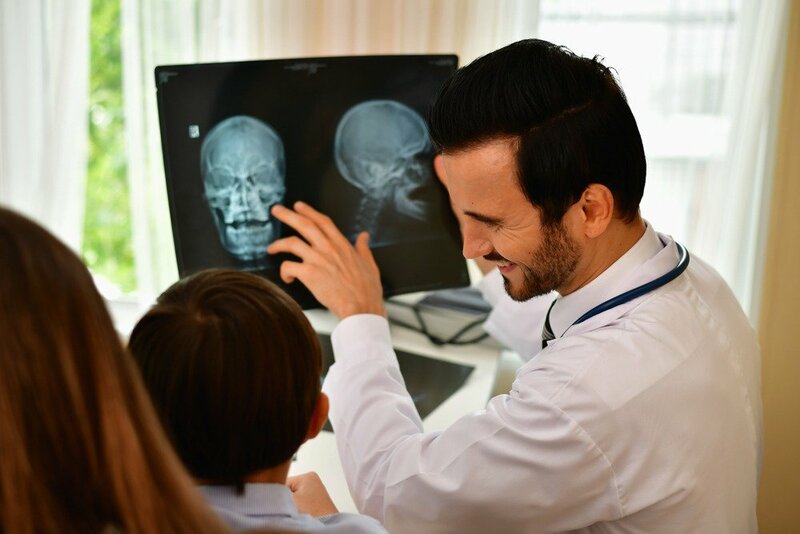 X-Rays - We have state-of-the-art digital x-ray technology, and highly trained radiologic technologists so that we can provide fast and accurate results. Stitches - Stitches, staples, glue, we can do it all. Wound closures can be a dreaded experience for kids and parents alike, which is why we utilize different distraction and pain management techniques and child friendly modalities to make sure your children have a more comfortable experience. Child-Friendly Modalities - Just 4 Kids Urgent Care would be incomplete without ways to keep your kids calm, soothed, or sometimes even distracted. We offer nitrous oxide, the Buzzy, J-Tip needle free injections, and more! After years as a provider for hospital-based pediatric care, Dr. Aaron Gardner saw the gap between a family’s pediatrician and the emergency room. Just 4 Kids Urgent Care is the answer to the problem, providing pediatric urgent care services in Idaho Falls. As proud as we are of the care we provide even our tiniest of patients, we are just as proud of our amazing and dedicated team of providers, nurses, and radiologic technologists who work hard to provide that care every day. We strive to deliver a comfortable urgent care experience that leaves your child feeling safe, stress-free, and ready to take on the world again.